Now that Thanksgiving is behind us, it's time to fill the house with Christmas decorations! If you regularly follow my blog, you probably know that I'm a glitter addict. I can't get enough, especially around Christmastime! 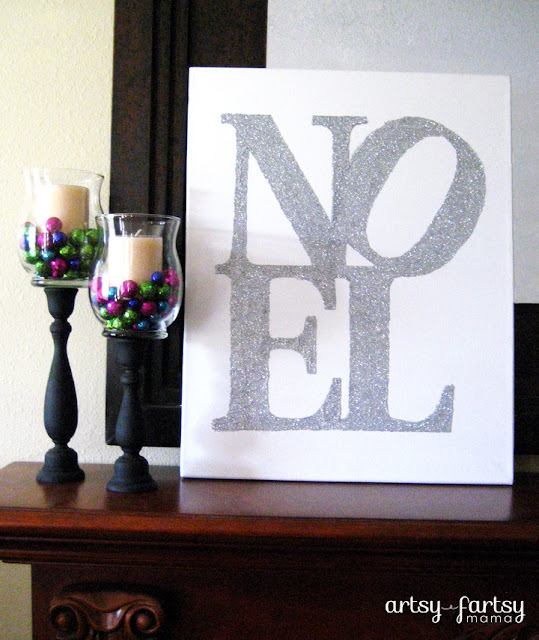 My latest addition to my Christmas decor is this Noel canvas made with Tulip Shimmer Paints. 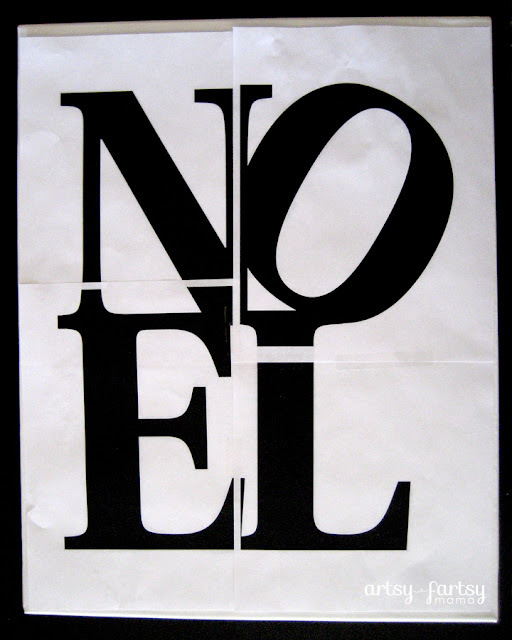 Step 1: I created the Noel design and printed in sheets to fit the 16x20 canvas. I then lined up the prints and taped them together to make a poster. Step 2: Prep the poster to transfer the image to the canvas. 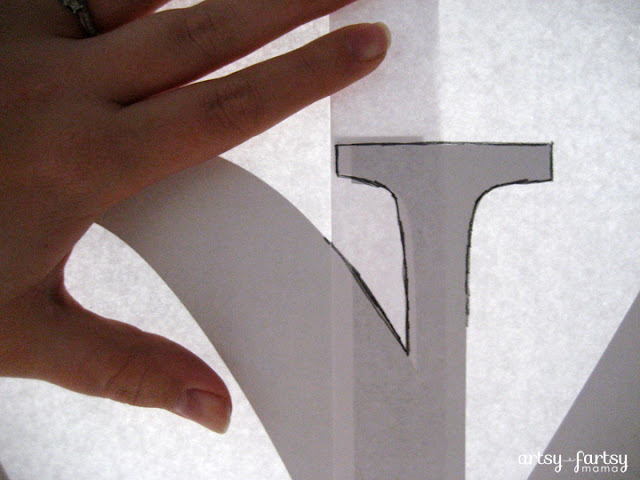 To do this, all you need to do is place the poster/prints on a window and trace the design back of the paper with a pencil. The lines don't have to be perfect. 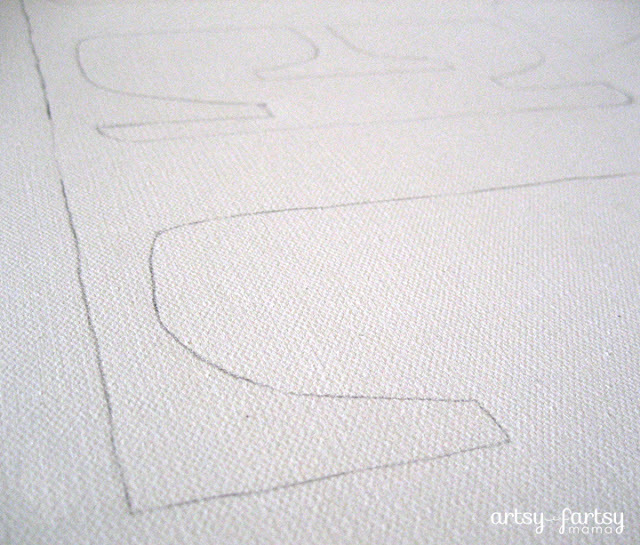 Step 3: Place the poster on the canvas and then carefully trace the front of the poster. 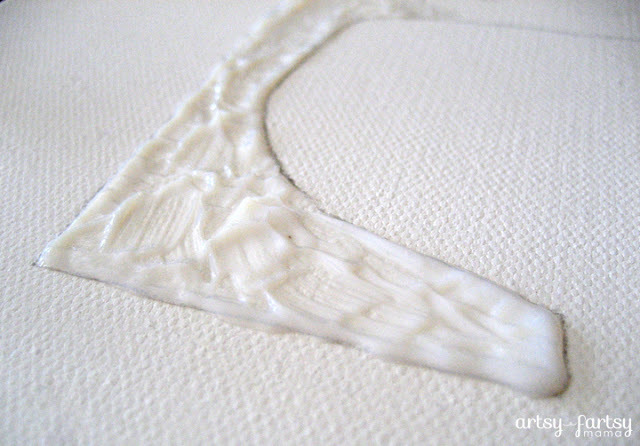 Press kind of hard so that the pencil lead transfers to the canvas. 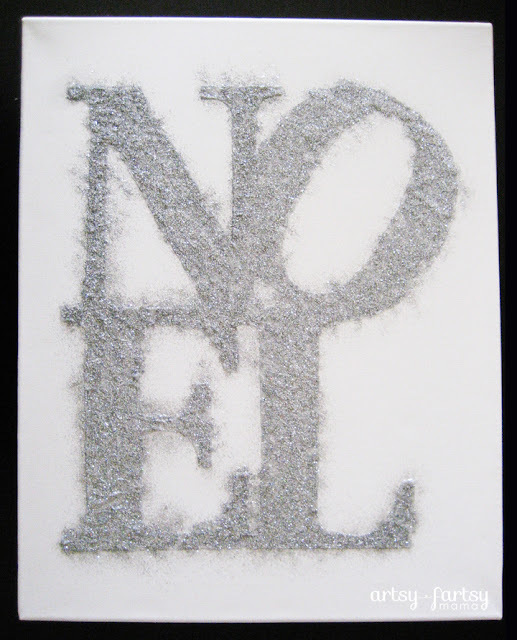 Carefully pull the poster off and you'll get a light image of the Noel letters on the canvas! 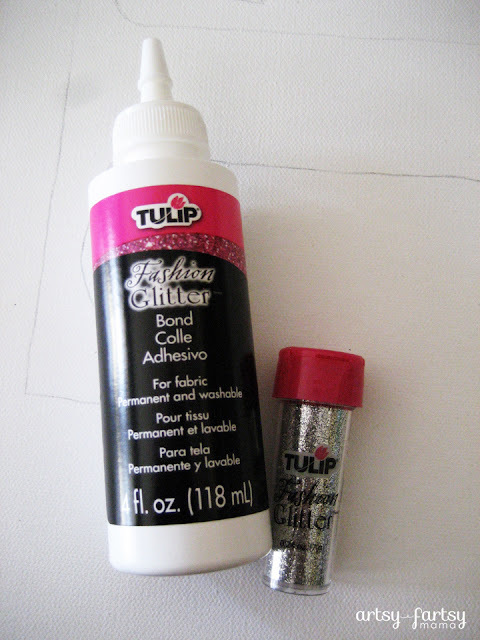 Step 4: Carefully fill in the letters with Tulip Fashion Glitter Bond. I traced the "L" and the "O" first because I didn't want the glue drying before I got to the end. I used the bottle to line the edges of the letters, then I took a paintbrush and evenly coated inside the letters. Repeat steps 4 & 5 for the "N" and "E". 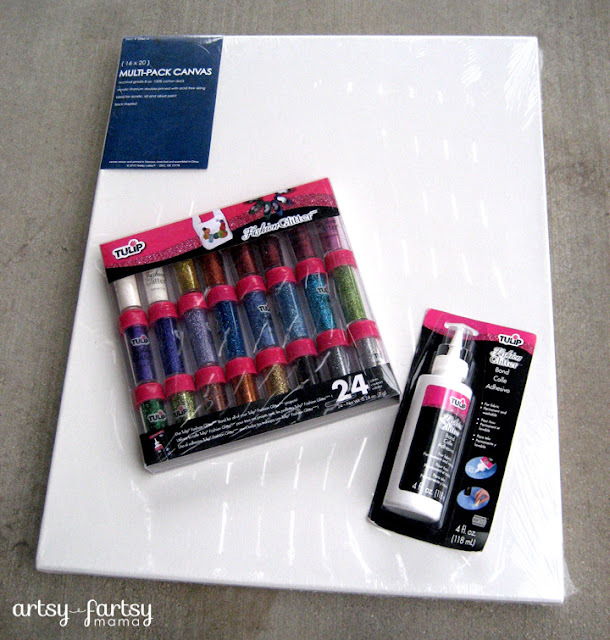 Step 6: Let the canvas sit for at least 2 hours for the glue to dry. 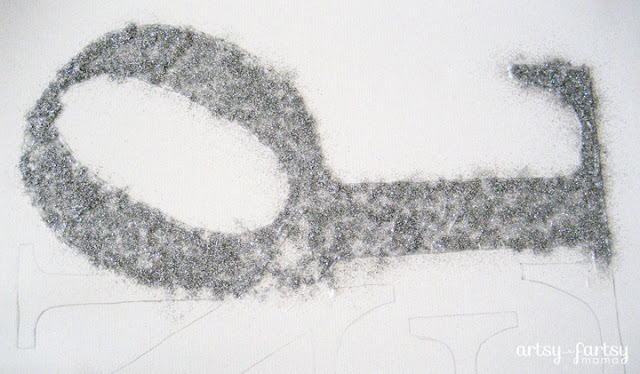 Carefully and SLOWLY stand the canvas up and dump off the excess glitter. Hang on the wall or stand on your mantel and that's it! Besides my tree, this is probably one of my favorite pieces of Christmas decor. I loved using these products and they were SO easy to use. I have more projects coming up using other Tulip products, like the Tulip Shimmer Sheets. So stay tuned! To see more products and project inspiration, you can visit I Love to Create and follow on Facebook, Twitter and Pinterest. Really cute! I like how you did this without any fancy tools (i.e. cutting machine, overhead projector, etc, etc). Can't go wrong with a little (or a lot) of glitter! I LOVE this! (The more, the better... LOL.) Christmas decor is all about the sparkle! This is so cute! I was looking for an extra decoration for my mantel, and this will be perfect! Ahhhhhhhh! I love love LOVE this!! GORgeous, girl! Oh I love this one too. And it is surprising how easy it looks to make. Very Cute! I love how simple but glittery it is. You can never have too much glitter. I love this! Pinning immediately! I love it Lindsay! Great job!!! LOVE this! Pinned and I'm totally going to try it soon. LOVE your canvas. Perfect holiday art fit for any house! This is beautiful, I love the sparkle! 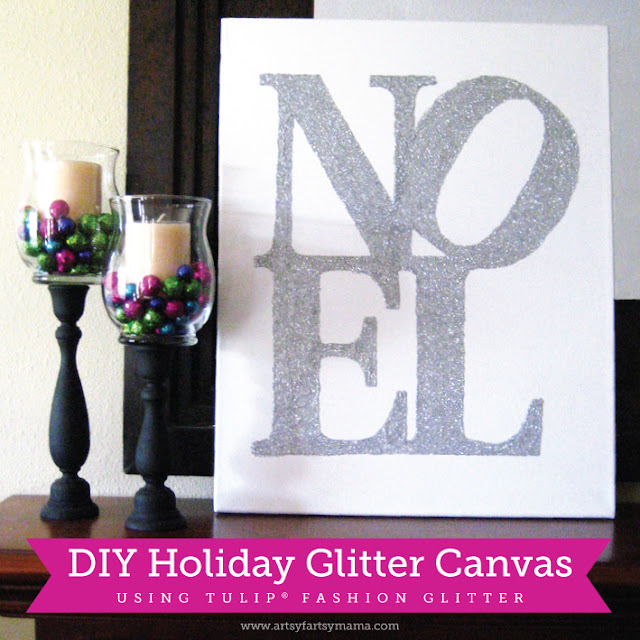 What a festive, sparkly canvas ... it turned out great and looks so easy! I love how this turned out! Gorgeous!! This is so, so cute! Would you be willing to share your pattern? Lindsay, I do so love this project! I'm having a homemade holiday link party with prizes and I thinks this would be a great project to link up. I'd love for you to stop by. Linking ends 12/3/12 at 11:59 pm Eastern time. Lindsay, I love this twist on the old LOVE stamp. This is so elegant! Thanks for sharing on the homemade holiday party. I love this canvas. It looks fabulous. I voted for you at 4 YouWith Live. Good luck. Hope youcan stop by my blog and see my latest project. That turned out adorable! 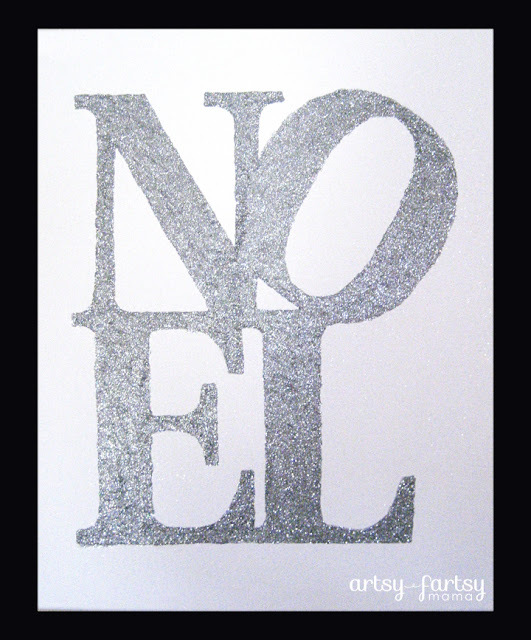 I love the glitter, especially silver! Thanks so much for sharing on Super Sweet Saturday. Love it! Thanks for sharing your great tutorial! So so cute! I did a Santa hat one similar to this but I really love the letters! What a great idea! I like it so much I'm going to pin it right after this comment :) Thanks for linking up with Frugal Crafty Home!